One of the most common problems of adolescence is fitting into society and dealing with bodily and environmental changes. This is not only limited to humans but also animals. 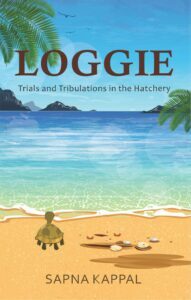 ‘Loggie’ is a story of a young turtle for whom adjustment to the new life after a mishap becomes the bane of her life. The story, though short, has many life lessons that will help deal with loss and also encourage the children to value their family and friends. Using rhyming quatrains as a medium of communication along with structured sentences, the author presents the conflict of the plot neatly and also manages to gather the reader’s sympathy. The cover of the book neatly presents the main idea of the plot. The illustrations (in broad strokes) strike the right chord. The main character of the story is Loggie, who is like every other teenage child who struggles with everyday pressure. The more the people around her try to ease her pain, the more she gets pulled into the abyss. But with time, she learns to adapt and finds solace in the company of those who have sailed in the same boat as hers. Overall, Loggie is for young kids who like to read something very light.